Dominican truck drivers say a fleet of about 20 trucks now on island bearing the logo "Dominica Strong" that engaged in dredging the Roseau River and elsewhere is like "taking bread from their mouths". The truckers want to know who brought them here. The trucks first carried Trinidad & Tobago license plates but they have now been outfitted with Dominican number plates. They are stationed on the grounds of the Massacre playing field. "We have trucks and we see what is going on, and we were not even given a chance to put our trucks for the jobs," a member of a building and contractor firm told the SUN. The official who requested anonymity because of the fear of reprisals said: "The local engineering firm of truckers sustained tremendous loss to equipment during the passage of Hurricane Maria. "What is even more alarming is a report that they may not have paid duties/ VAT and other taxes. This puts them at an unfair advantage over our local companies. We have no upward mobility to local trucking and excavating and it must be noted that we are the first respondents after a disaster," the official said. "The government has made no meaningful attempt to approach us about quantum of work or incentive for scope of work after Hurricane Maria while foreign contractors are given such incentives and even deposits." Earl Laudat, the President of the Tipper Truckers Association (TTA) was also concerned about the arrival of the T&T trucks. "I just saw those trucks driving in Dominica and doing work. I was shocked and stunned and have no idea who brought them," Laudat said. "As a businessman in that field, I am also very concerned. I think the banks are also concerned because it is taking bread away from us. We were not informed about the trucks coming into Dominica by anyone…I also have no idea who brought them in and who they belong to. "We have a meeting this weekend and from there we will decide on what action and the way forward for us. From Erika we did our duty as truckers and so I don't know why we were left out. No one called us to a meeting to say that we don't have the capacity to so do". "The trucks were purchased in Trinidad by (a well- known senior Dominica Labour Party operative) and it is all part of the government campaign machinery …while I am a supporter of the government, it is not right to treat our local truck drivers in that way," the source said. The source said the cost of the operations was "a few millions". When contacted on Thursday January 25, 2018 and on Friday January 26, 2018 for her comments on the matter, Minister for Communication & Works Miriam Blanchard said: "Didn't you hear what the Prime Minister said on the matter…I don't want to duplicate what he has said." When pressed further, she added: "Before I speak I must research the matter and will get back to you, you can also call me back." However, several subsequent calls to her telephone went unanswered and a visit to her office to obtain her statement proved futile. 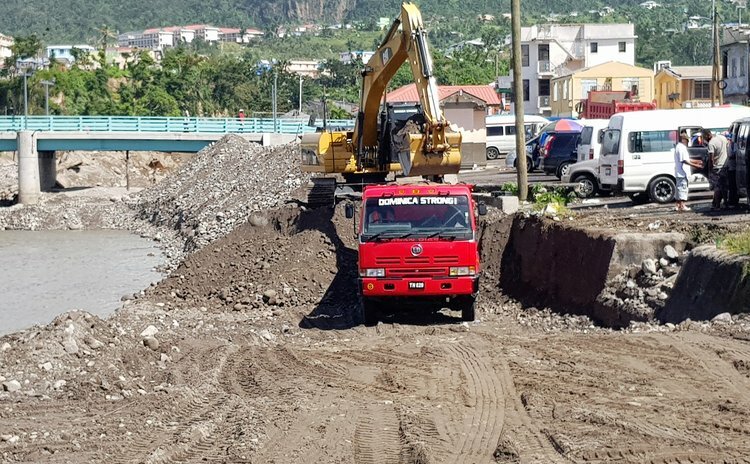 The Government suggested earlier that local truckers and heavy equipment owners did not possess the capacity to perform the dredging operations in time for the new hurricane season and hence the hiring of assistance from Trinidad.